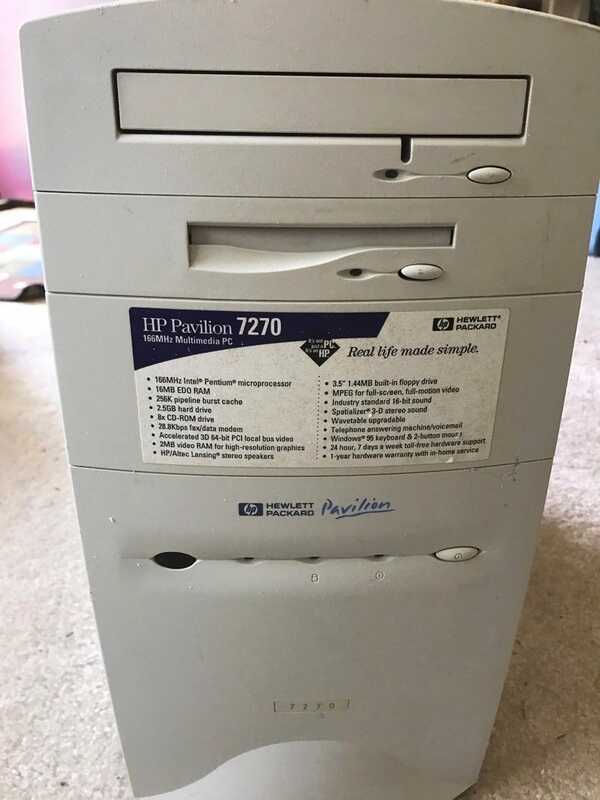 Got an HP Pavilion 7270 today. Specs are exactly as it says on there, looks completely original. Pentium 166MHz, 16MB EDO RAM, 2.5GB hard drive, 2MB onboard S3 graphics, some proprietary HP sound card with an ESS chip, Windows 95 on the original hard drive too. More dust and such. The fan cover had all sorts nearly black decade+ old dust on it. Fun fact, the case had a date imprinted on it, 7-18-1996. Exactly 21 years today. All cleaned up! Magic eraser and sand paper. I used an air compressor to dust out the inside and wiped down every surface with a lightly damp paper towel then dried up. Rear plate is much improved. Another glance at the inside. These are the cards it came with, a 28.8K ISA modem (bottom) and some proprietary sound card. Don’t care for these. The sound card uses a proprietary cable to connect to the motherboard directly instead of using an ISA slot. Weird. A Novell NE2000 ISA ethernet card clone. Other side of the Number Nine card... what’s that? A Cirrus Logic CL-GD5424 chip for use in MS-DOS! Pretty cool. Creative Sound Blaster 16 with OPL3 YMF-262 chip and a Creative WaveBlaster II wavetable daughtercard. Note the manual volume wheel! A 2GB 5400RPM IBM hard drive that’s faster and quieter than the Bigfoot. Using this instead. Also bumped up the RAM from 16MB to 64MB. Much better.